When Diet Coke debuted in 1982, it was aimed at a maturing baby boomer generation seeking a substitute for the sugar-filled sodas of their youth. Now, as similarly sugar-averse millennials take the reins as the country’s top consumer cohort, Diet Coke is seeking to connect with the new generation via its largest redesign effort to date. The Coca-Cola Company yesterday announced a relaunch of the Diet Coke line that includes new packaging and new flavours, while retaining the same fan-favourite formula. Coming just months after the company’s successful rebranding of Coke Zero as Coke Zero Sugar, the Diet Coke makeover is geared toward millennial consumers. The line will now be presented in sleek 12oz (354ml) slimline cans and include four new additional SKUs, including Ginger Lime, Feisty Cherry, Zesty Blood Orange, and Twisted Mango. The cans will debut with a suggested retail price of $1.19 per 12 oz can or between $3.99-$4.29 for an 8-pack. “I think this is another proof point about how serious we are about continuing to accelerate our zero calorie portfolio in the company, both on the sparkling side and the still side of the business,” Rafael Acevedo, Coca-Cola North America’s group director for Diet Coke told BevNET. According to the company, more than 10,000 consumers were interviewed for their input on potential new flavours and packaging updates. To forge a more authentic connection with the demographic, the company tapped 26-year-old Elyse Larouere to help lead the design team. Larouere previously helmed the company’s “Share a Coke and a Song” campaign in 2016. Acevedo cited the flavour experimentation happening in alcoholic beverages such as bourbon and craft beer as inspiration. The Feisty Cherry, for example, has a spicier kick to it than the traditional Diet Coke Cherry flavour, something the company believes will appeal to younger consumers. 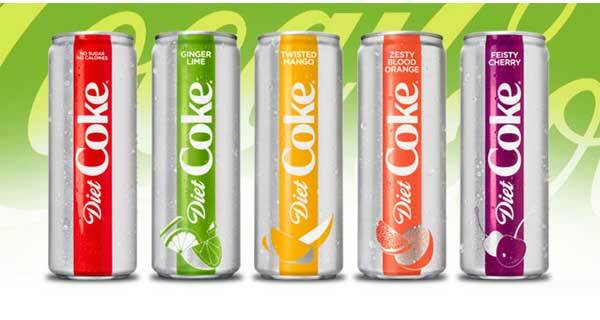 Along with the new flavours, Diet Coke Lime and Diet Coke Cherry will be removed from retail but will still be sold online for fans of the flavour who don’t like the change. As well, the company will continue to produce the traditional 12 oz short cans in addition to the slimline products. Despite growing concerns over the use of aspartame in diet sodas, Acevedo said changing the taste of the core Diet Coke product was “not on the table”. The 2015 decision by Coke’s archrival PepsiCo to remove aspartame from Diet Pepsi was met with a swift backlash from consumers, leading the company to offer aspartame and aspartame-free varieties. 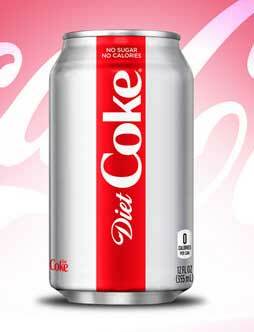 In contrast, the Diet Coke revamp is focused on personality and differentiation, not formula. To promote the relaunch, Coke has eschewed its usual reliance on A-list celebrities for marketing campaigns, opting for lesser known pop culture figures such as actor Karan Soni, who’s credits include the films Deadpool and Office Christmas Party, in commercials in order to keep the focus on the products. Dollar figures for the accompanying marketing campaign were not released, but the company will utilise the upcoming Winter Olympics to make its first big push to the public. The rebrands for both Diet Coke and Coke Zero come as CSD brands are focusing on their zero calorie portfolios. Although diet soda sales have been consistently dropping for several years, with sales of Diet Coke dropping by 3.7 percent in 2017 according to Nielsen, the Coke Zero Sugar rebrand produced renewed interest and doubled the rate of sales for the line.